"Europe resembles an old garment that has been turned," wrote Dr. Benjamin Rush to William Peterkin in 1784. "The habits of your people forbid every species of improvement in human happiness. In America, everything is new and yielding. Here, genius and benevolence may have full scope. Here the benefactor of mankind may realize all his schemes." 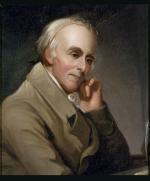 Benjamin Rush, by Charles Willson Peale, after Thomas Sully, 1818. The United States' political independence and new frames of representative government based upon Reason and political "science," also unleashed the idealistic belief that human lives and society could be "reformed" for the better. 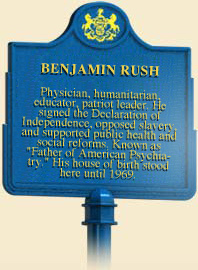 In the early years of the New Republic, no man had more schemes for improvement than Philadelphia physician Benjamin Rush. The best-known physician and medical teacher of the early Republic, Rush in 1786 set up a free hospital for the poor in Philadelphia, the first in the nation. Goal, [Jail] in Walnut Street Philadelphia, by William Birch, 1799. Education was one of his main concerns. A strong supporter of the settlement of western Pennsylvania and the health of rural residents, he in the early 1780s assisted John Dickinson in founding Dickinson College in Carlisle and helped persuade the Reverend Dr. Charles Nisbet to immigrate from Scotland to be its president. Unlike the curricula of the older American colleges which stressed Latin and Greek, Rush and his colleagues stressed the modern languages - French and German being the most useful - along with history and the sciences. When his fellow Presbyterians objected to the school's non-sectarian policy and the fact that it wooed students away from eastern colleges, Rush reverted to the Anglican faith of his youth, in part because he approved of the way Bishop William White of Philadelphia had led the movement to establish an autonomous, American Episcopal rather than Anglican church. He also insisted women be educated much like men, learning geography, history, philosophy, and science, all of which was taught at the "Young Ladies" Academy of Philadelphia, which opened in 1787. Legal and criminal reform was another of Rush's causes. In an age when a large number of crimes were capital offenses, he opposed the death penalty and America's stark and unsanitary prisons, which simply jailed people without attempting to reform them. 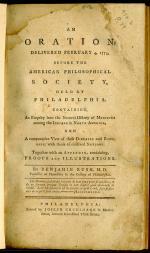 In 1787 Rush founded the Philadelphia Society for Alleviating the Miseries of Public Prisons, the world's first organization devoted to prison reform, and published "An Enquiry into the Effects of Public Punishments Upon Criminals" and recommended that "boily pain, labor, watchfulness, solitude and silence" served as "the proper remedy or remedies for particular vices." Rush's principles were first instituted in the new Walnut Street Prison, which opened in 1790, and later applied in the Eastern State Penitentiary, one of the nation's most famous tourist attractions of the 1830s and 1840s. Rush insisted that his method would lead to prisoners' moral reformation by forcing them to turn their thoughts to their actions and the dreadful consequences thereof. Fascinated by the study of Native Americans and his fellow citizens, Rush also believed most crime was the result of alcoholism. He was no teetotaler - he enjoyed his wine and cider - but condemned the abuse of spirits. One of the founders of the American temperance movement - one of the most popular and long-lived reform movements in American history - Rush in 1789 designed "A Moral and Physical Thermometer" to register the degrees of alcoholism. He also condemned the use of tobacco, which he believed to blur the mind, and may have been the first physician to link smoking with cancer. "Who can see groups of boys of six or eight years old in our streets smoking segars, without anticipating such a depreciation of our posterity in health and character, as can scarcely be contemplated at this distance of time without pain and horror." Anti-slavery was another of Rush's causes. He did much pro bono work for Philadelphia's black community, and ensured that the Free African Society and the biracial Pennsylvania Abolition Society, both founded in 1787, worked closely together. During the great yellow fever epidemic of 1793, which killed 4,000 of the town's 50,000 inhabitants, Rush at first believed blacks were immune to the disease. When he learned they were not, he applauded their efforts to nurse the sick as a sign of their Christian charity and republican virtue, in contrast to the leaders of the federal government who left the city for healthier climes. Rush also believed that "heroic" treatment, by which he meant bleeding and purging, could successfully cure the disease. This approach seems to have worked with Alexander Hamilton, and perhaps saved thousands of lives. In the long run, however, Rush's treatments usually did more harm than good. 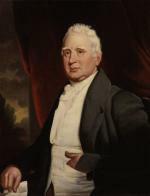 Most of Philadelphia's doctors disagreed with Rush, however, and when journalist William Cobbett called him a murderer in Porcupine's Gazette, the ever-contentious Rush sued him for $5,000 and won. As a doctor, educator, chemist, humanitarian, politician, author, soldier, and abolitionist, he was among the most talented men of the new nation. We owe him one further debt: in his old age, Rush began a correspondence with John Adams, who had appointed him treasurer of the United States Mint in 1797, a post he held until his death at the age of sixty-seven in 1813. Rush was responsible for reconciling Adams with Thomas Jefferson, whose political party he had begun to support in the 1790s when he failed to obtain a government post under President Washington. Both sets of correspondence contain some of the profoundest thoughts on the past and future of the American experiment. Alyn Brodsky, Benjamin Rush: Patriot and Physician (New York: Truman Talley), 2004. Douglas Adair and John Schutz, ed., The Spur of Fame: Dialogues of John Adams and Benjamin Rush, 1805-1813 (San Marino: Huntington Library), 1966. Claire Fox and others, Benjamin Rush, M.D. : A Bibliographic Guide (Westport: Greenwood), 1996. David Freeman Hawke, Benjamin Rush: Revolutionary Gadfly (Indianapolis: Bobbs-Merrill), 1971.